I love farmer's markets. They are a fairly new experience for me because for years, I was too exhausted from work and running the girls around all week to go anywhere on a Saturday morning. I do have memories of going to them as a kid; my mom would buy lots of fruit and vegetables that were in wooden woven pint containers and little bushel baskets. When we got home, she would let us husk the corn outside. Then we would pretend we were Rumpelstiltskin making gold by turning out bikes upside down and running the corn silk through the spinning wheels. Although I never showed my girls that fun little activity, they discovered farmer's markets on their own. When Jenn was living close by, she took me to one by her house and I remembered how wonderful they are. This summer I have been inspired by the beautiful vegetable salads I've been seeing in the foodie magazines. And, when I get the chance to go out to lunch, I've been so impressed by how eating one's vegetables seems to be back in style; it's so trendy now to like corn and beets! The corn, bean, and tomato salad posted here is copied from Taste, a local restaurant. The beet salad came about after seeing a dazzling photo in Bon Appetit (different recipe than theirs however). The last salad is just fresh tomatoes and basil with a simple homemade balsamic vinaigrette. It's so easy to eat healthy in the summertime. Grab a fork; enjoy the feast! Either use left over corn on the cob or cook the corn by husking it, brushing off the corn silk, and dropping it in boiling water for seven minutes. When it is cooled, stand the cob upright and use a sharp knife to cut off the kernels. It's alright to have some kernels that stay together in big "patches". Snap the ends off the beans, rinse them, and place in a sauce pan. Cover them with water, bring it up to a boil, then turn the heat down to a simmer and cook for just barely five minutes. They should be tender but not mushy. Drain them and set aside. Wash, core, and chop the tomatoes. Wash, cut the little end roots off, and slice the green onions. 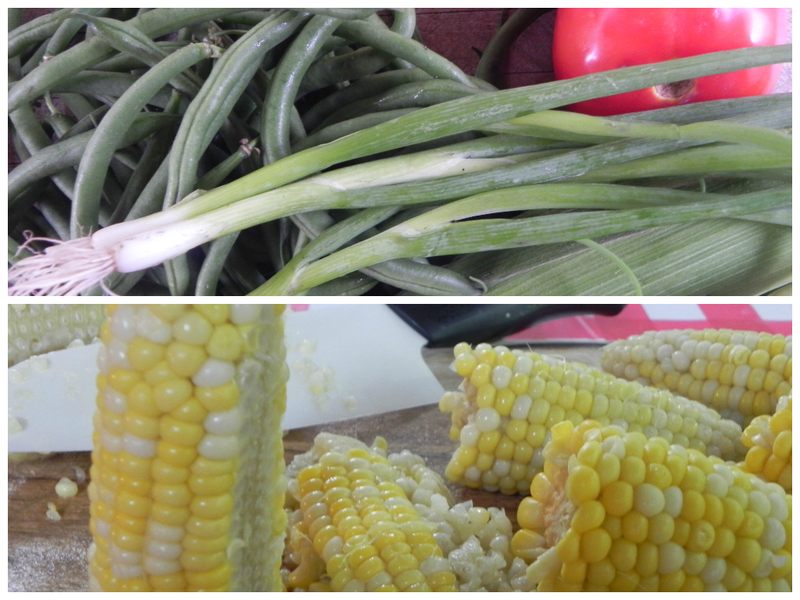 Place the corn, beans, tomatoes, and green onions in a bowl. Whisk the vinegar, oil, salt, and pepper together. Pour over the vegetables in the bowl and gently toss. *There is a little Middle Eastern grocery store near my house where I can buy jarred preserved lemon and labneh. The labneh is just really thick yogurt - I've been buying it for years - it's great for dips and sauces for Mediterranean food. Preheat the oven to 400 degrees. Wash the beets and cut off the tops to get rid of the stems. Place the beets in a foil "packet" and drizzle them with olive oil. Shake a little salt and pepper on them and seal them up. Wash and core the yellow pepper, cutting it into four quarters. Place the yellow pepper in another foil packet and drizzle it with olive oil. Shake some salt and pepper on it and seal it up. Place both packets in the preheated oven and let them cook for an hour. Let them cool. Peel or cut the skin off of the beets and cut them into slices. Cut the pepper into strips. Arrange the beets and pepper slices on a serving platter. Whisk together the lemon juice, olive oil, and preserved lemon or zest. Pour over the beets and peppers. Sprinkle the cut up dill over the vegetables. Drizzle with just a bit more olive oil. Sprinkle the kosher salt and fresh ground pepper on top. Place two tablespoons of the yogurt on each serving. Wash, core, and slice the tomatoes. Gently toss with the fresh basil and put in a serving bowl or platter. Whisk together the olive oil, vinegar, garlic, 1/8 teaspoon salt, and pinch of pepper. Pour the dressing over the tomatoes and basil and sprinkle with the kosher salt and pepper.